All of the gods have champions, be them paragons of good or evil, chaos or law. The Guardian is a champion of Glitanius. Healers, helpers and warriors of good. Guardians sow seeds of hope and vanquish evil wherever they travel. Adventures: Guardians are humbled by the power that Glitanius has awarded them, and they take almost any chance to spread his goodness. They often join groups that seek to help the weak, protect the planet and promote life. They almost certainly would consider it an obligation to join any group opposed to Ravis. But for the most part they take their power wherever it will do the most good. Characteristics: . Sacrifice, respect for life, and kindness. These things above all else are known to the Guardian. These champions of good display traits of empathy, selfless service and are often known as benefactors to the poor and otherwise helpless. If a Guardian had a motto it might sound something like “do unto others as you would have them do unto you, help those in need, respect the land and all the life of Draconspire. Oppose the will of evil wherever you may find it “. Alignment: Guardians are good through and through. In fact to be a Guardian you must be of good alignment, or Glitanius strips your powers from you. Religion: All Guardians pay homage to the god Glitanius. All Guardians have an affiliation with the church of Glitanius known as the Gates of Panacea. See the Gates of Panacea organization for more details and to calculate your starting affiliation score. Background: Guardians at some point in their life feel a calling to service. The traits of goodness are usually present all of their life, such as a love for animals and plants, helping the local hospitals and church, giving selflessly for the well being of others. The calling may come at anytime and for any reason, but usually surfaces when the need is most dire. Such as when faced by true evil, or while witnessing an inhumane act. No matter how the path takes them to Glitanius the Gates of Panacea accepts them, trains them, and hones them into the fine instrument of good that is the Guardian. Races: The most needful societies are consequently the very environments that Guardians spring from. Human, Dwarven and Elven communities all have their fair share of Guardians. You can almost certainly expect to run into several Guardians at any House of the Five. Other Classes: Guardians enjoy other Guardians, and anyone else who strives to assist those in need or root out evil. Clerics of Glitanius are always welcome allies. They will never associate with evil party members associated with the Shadow Sanctum, and deal with them only with the utmost of caution. Role: The Guardian’s chief role is as a martial combatant, however they make good support characters for other roles. 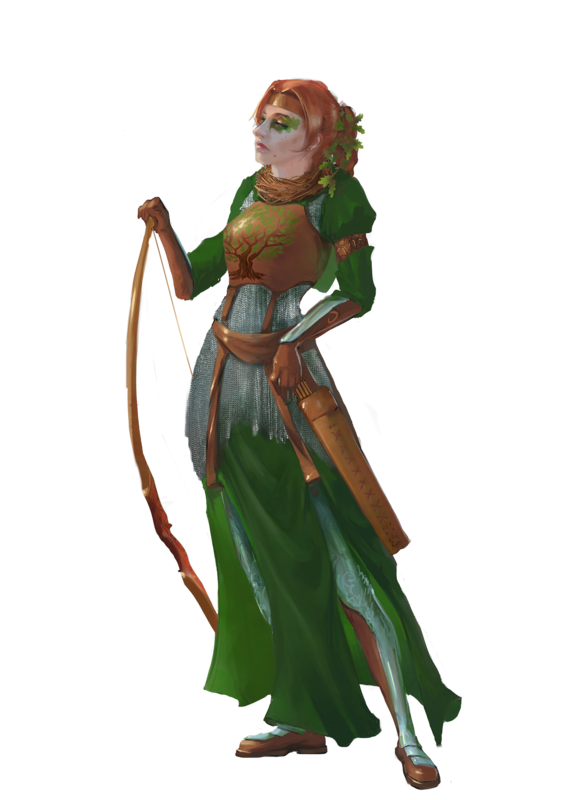 Their ability to influence animals and plants lets them function in some ways like a Druid or Ranger. Guardians have the following game statistics. Abilities: As a martial class the Guardian benefits well from a high Strength and Constitution score. Most of the Guardian’s skills and abilities focus on Charisma, and their spell casting relies on a decent Charisma score. The Guardian’s class skills (and the key ability for each skill) are Craft (Int), Diplomacy (Cha), Handle Animal (Cha), Heal (Wis), Knowledge Nature (Int), Knowledge Local (Int), Knowledge Religion (Int), Profession (Wis), Ride (Dex) Sense Motive (Wis), Spell craft (Int) and Survival (Wis). The Following is a list of class features for the Guardian class. Weapon and Armor Proficiency: Guardian are proficient with all simple and martial weapons, with all types of armor (heavy, medium and light), and with shields (except tower shields). Aura of Good (Ex): The power of a Guardian’s aura of good (see the detect good spell ) is equal to their Guardian level, just like the aura of a cleric of Glitanius. Detect Evil (Sp): At will, a Guardian can use detect evil as a spell like ability. This ability functions just like the Paladins detect evil class feature. Smite Evil (Su): One per day, a Guardian can call out to the powers of good to aid them in their struggle against evil. As a swift action, the Guardian chooses one target within sight to smite. If this target is evil, the Guardian adds their charisma bonus (if any) to their attack rolls and adds their Guardian level to all damage rolls made against the target of their smite. If the target of the smite is an evil outsider with the evil subtype, an evil aligned dragon, or an undead creature, the bonus to damage on the first successful attack increases to 2 points of damage per Guardian level. Regardless of the target, smite evil attacks automatically bypass any DR the creature may possess. In addition, while smite evil is in effect, the Guardian gains a deflection bonus equal to their charisma modifier (if any) to their AC against attacks made by the target of the smite. If the Guardian targets a creature that is not evil, the smite is wasted and has no effect. The smite evil effect remains until the target of the smite is dead or the next time the Guardian rests and regains their uses of this ability. At 4th level, and every 3 levels thereafter, the Guardian may smite evil one additional time per day to a maximum of 7 times per day at 19th level. Divine Grace (Su): At 2nd level, a Guardian gains a bonus equal to their Charisma bonus (if any) on all saving throws. Lay on Hands (Su): Beginning at 2nd level, a Guardian can heal wounds (their own or those of others) by touch. Each day they can use this ability a number of times equal to half their Guardian level plus their Charisma modifier. With one use of this ability, a Guardian can heal 1d6 hit points of damage for every two Guardian levels they possess. Using this ability is a standard action, unless the Guardian targets themselves, in which case it is a swift action. Despite the name of this ability, the Guardian only needs one free hand to use this ability. Alternatively, a Guardian can use this ability to deal damage to undead creatures, dealing 1d6 points of damage for every two levels of Guardian. Using lay on hands in this way requires a successful melee touch attack and doesn’t provoke an attack of opportunity. Undead do not receive a saving throw against this damage. This is a positive energy effect. Life Aura (Su): Beginning at 3rd level, a Guardian radiates life. This aura extends 30’ and provides two benefits. The first being that the Guardian can stabilize any dying creature within it’s aura by spending a standard action that does not provoke an attack of opportunity. This aura also bestows the knowledge of whether or not a target is living/undead or never was alive within its range if the Guardian focuses on a specific target which requires a swift action. The Guardian can suppress or resume their Life Aura as a free action, but only on their turn. Mercy (Su): At 3rd level, and every 3 levels thereafter, a Guardian can select one mercy. Each mercy adds an effect to the Guardian’s lay on hands ability. Whenever the Guardian uses lay on hands to heal damage to one target, the target also receives the additional effects from all the mercies possessed by the Guardian. If a mercy removes a hindering condition or affliction, such conditions return after 1 hour (if not expired) unless the mercy removes the affliction that causes the condition. At 3rd level, the Guardian can select from the following initial mercies. Fatigued: The target is no longer fatigued. Shaken: The target is no longer shaken. Sickened: The target is no longer sickened. At 6th level, the Guardian can select from the following mercies. Dazed: The target is no longer dazed. Diseased: The Guardian’s lay on hands ability also acts as a remove disease spell, using the Guardian’s level as the caster level. Staggered: The target is no longer staggered, unless the target remains at 0 hit points. At 9th level, the Guardian can select from the following mercies. Cursed: The Guardian’s lay on hands ability also functions as a remove curse spell, using the Guardian’s level as the caster level. Exhausted: The target is no longer exhausted, the Guardian must have the fatigue mercy before selecting this mercy. Frightened: The target is no longer frightened. The Guardian must have the shaken mercy before selecting this mercy. Nauseated: The target is no longer nauseated: The Guardian must have the sickened mercy before selecting this mercy. Poisoned: The Guardian’s lay on hands ability also acts as a neutralize poison spell, using the Guardians level as the caster level. At 12th level, the Guardian can select from the following mercies. Blinded: The target is no longer blinded. Deafened: The target is no longer deafened. Paralyzed: The target is no longer paralyzed. Stunned: The target is no longer stunned. These abilities are cumulative. For example, a 12th level Guardian’s lay on hands ability heals 6d6 points of damage and could add up to 4 bonuses from the above lists that the Guardian has selected as their mercies. Channel Positive Energy (Su): When a Guardian reaches 4th level, they gain the supernatural ability to channel positive energy like a Cleric. Using this ability consumes two uses of their lay on hands ability. A Guardian uses their level as their effective Cleric level when channeling positive energy. This is a Charisma-based ability. Spells: Beginning at 4th level, a Guardian gains the ability to cast a small number of divine spells which are drawn from the Guardian spell list (see below). A Guardian must choose and prepare spells in advance like a Cleric. To prepare or cast a spell, a Guardian must have a Charisma score equal to at least 10 + the spell level. The Difficulty Class for a saving throw against the Guardian’s spell is 10 + the level of the spell + the Guardian’s Charisma modifier. Like other spell casters, a Guardian can only cast a certain number of spells of each level per day. Their base daily spell allotment is given in the table above. In addition, a Guardian receives bonus spells per day if they have a high Charisma score. When the above table indicates that a Guardian gets 0 spells per day of a given spell level, they gain only the bonus spells they would be entitled to based on their Charisma score for that spell level. A Guardian must spend 1 hour each day in quiet prayer and meditation to regain their daily allotment of spells. A Guardian may prepare and cast any spell on the Guardian spell list, provided that they can cast spells of that level, but they must choose which spells to prepare during the daily meditation. Through 3rd level, a Guardian has no caster level. At 4th level and higher a Guardian’s caster level is equal to all class levels in the Guardian class -3. Divine Bond (Sp): Upon reaching 5th level, a Guardian forms a divine bond with Glitanius. This bond can take one of two forms. The first bond allows the Guardian to enhance their weapon as a standard action, provided the weapon is a bow of any kind. When called, a celestial spirit enhances the weapon, causing it to shed light as a torch for 1 minute per Guardian level. At 5th level, this spirit grants the weapon a +1 bonus. For every three levels beyond 5th, the weapon gains another +1 bonus, to a maximum of +6 at 20th level. These bonuses can be added to the weapon or they can be used to add any of the following weapon properties: holy, brilliant energy, defending, disruption, acidic, acidic burst, keen, merciful, and speed. These bonuses do not stack with any properties the weapon already has. If the weapon is not magical, at least a +1 enhancement bonus must be added before any other abilities can be added. The celestial spirit imparts no bonuses if the weapon is held by anyone other than the Guardian, but resumes giving bonuses if returned to the Guardian. A Guardian can use this ability once per day at 5th level, and one additional time per day for every four levels beyond 5th, to a total of four times per day at 17th level. If a weapon bearing a celestial spirit is destroyed, the Guardian loses the use of this ability for 30 days, or until they gain a level, whichever comes first. During this 30-day period, the Guardian takes a –1 penalty on attack and weapon damage rolls. The second bond allows a Guardian to gain the service of an unusually intelligent, strong, and loyal steed to serve them in her crusade against evil. This mount is usually a heavy warhorse (for a Medium Guardian) or a warpony (for a Small Guardian). Once per day, as a full-round action, a Guardian may magically call their mount from the celestial plane of Leafhome in which it resides. This ability is the equivalent of a spell of a level equal to one-third the Guardian’s level. The mount immediately appears adjacent to the Guardian and remains for 2 hours per Guardian level; it may be dismissed at any time as a free action. The mount is the same creature each time it is summoned, though the Guardian may release a particular mount from service. Each time the mount is called, it appears in full health, regardless of any damage it may have taken previously. The mount also appears wearing or carrying any gear it had when it was last dismissed. Calling a mount is a conjuration (calling) effect. At 11th level, the mount gains the celestial template (see the Pathfinder Bestiary) and becomes a magical beast for the purposes of determining which spells affect it. At 15th level the mount gains spell resistance equal to the Guardian’s level +11. Should the Guardian’s mount die, it immediately disappears, leaving behind any equipment it was carrying. The Guardian may not summon another mount for 30 days or until they gain a Guardian level, whichever comes first, even if the mount is somehow returned from the dead. During this 30-day period, the Guardian takes a –1 penalty on attack and weapon damage rolls. Nature’s Warden: At 8th level the Guardian may choose either of the Animal Domains granted powers, they may now use the selected power, using the Guardians class level in place of Cleric levels. Once selected the power cannot be switched. Life’s Servant: At 11th level the Guardian treats the initial attitude of any good aligned creature they meet that shares a language with the Guardian as 1 step better than they otherwise would find them in when attempting diplomacy. However, any evil aligned creature they meets initial attitude is 1 step lower when attempting diplomacy. Aura of Faith (Su): At 14th level, a Guardian’s weapons are treated as good aligned for the purposes of overcoming damage reduction. Any attack made against an enemy within 10 feet of them is treated as good aligned for the purposes of overcoming damage reduction. This ability functions while the Guardian is conscious, but not if they are unconscious or dead. Aura of Righteousness (Su): At 17th level, a Guardian gains DR 5/evil and immunity to compulsion spells and spell-like abilities. Each ally within 10 feet of them gains a +4 morale bonus on saving throws against compulsion effects. This ability functions while the Guardian is conscious, but not if she is unconscious or dead. Champion of Glitanius (Su): At 20th level, a Guardian becomes a conduit for the power of Glitanius Their DR increases to 10/evil. Whenever they use smite evil against an evil outsider, the outsider is also subject to a banishment effect using their Guardians level as the caster level (their weapon and holy symbol automatically count as objects that the subject hates). In addition, whenever they channel positive energy, they channel the maximum possible amount. Oathbound: A Guardian is Oathbound to whatever they promise. If a Guardian breaks their word they lose all Guardian class abilities until they atone, see Ex - Guardians below. Associates: While a Guardian may adventure with chaotic, lawful or neutral allies, a Guardian avoids working with evil characters or with anyone who consistently attempts to do evil deeds. Under exceptional circumstances, a Guardian can ally with evil associates, but only when the greater good is at stake and in the most dire of circumstances. A Guardian does not need an atonement spell during such an unusual alliance as long as their goals are met in the end—the greater good is all that matters. A Guardian may accept only henchmen, followers, or cohorts who are good. Level 1: Bless, Bless Water, Bless Weapon, Cure Light Wounds, Detect Poison, Divine Favor, Endure Elements, Magic Weapon, Protection from Evil, Read Magic, Resistance, Restoration (Lesser), Virtue Level 2: Bull‘s Strength, Delay Poison, Eagle‘s Splendor, Owl‘s Wisdom, Remove Paralysis, Resist Energy, Shield Other, Speak with Animals, Undetectable Alignment, Zone of Truth, Level 3: Cure Moderate Wounds, Discern Lies, Dispel Magic, Heal Mount, Magic Circle Against Evil, Magic Weapon (Greater), Prayer, Remove Blindness/Deafness, Remove Curse, Speak with Plants. Level 4: Break Enchantment, Commune with Nature, Cure Serious Wounds, Death Ward, Dispel Evil, Holy Sword, Neutralize Poison, Restoration, Tree Stride.